The GMC Sierra 2500 is up against some pretty tough competition, but still manages to stand out as a really good heavy duty truck. With a combination of strong engines, a spacious interior and good comfort and refinement levels, the GMC Sierra 2500 is undeniably a very appealing ownership prospect. However, it’s not faultless. Though the ride quality and refinement are good, they’re not quite up to the standards set by the class-leaders, and the GMC Sierra 2500 is quite pricey in comparison with its chief rivals. In spite of these aspects, we still feel the GMC Sierra 2500 is a truck that’s worth having a closer look at. The GMC Sierra 2500 has a pretty spacious cabin. As expected from a vehicle of this size, the GMC Sierra 2500 has a pretty spacious cabin. In all of the GMC’s cab configurations (ranging from the three-seater ‘Regular Cab’, to the larger six-seater ‘Crew Cab’ and mid-sized ‘Double Cab’ six-seater), there is plenty of head and leg room on offer for the driver and passengers up front, and the seats are rather supportive too. Rear seat accommodation is pretty good. Though some rivals do offer a more spacious back row, head and leg room is fairly good on the GMC Sierra 2500 (especially on the large ‘Crew Cab’ models, which we particularly recommend to buyers who’ll need the back seats to comfortably accommodate adults on longer journeys). Interior storage space is pretty good in the GMC Sierra 2500, with the sizeable door bins being particular highlights. Fit-and-finish on the GMC Sierra is pretty good, too. The quality of the materials used is of a quality that’s befitting of the vehicle’s price tag, with the quantity of soft-touch materials just about making up for the fact you’ll need to spend at least $47,455 on a GMC Sierra 2500 just to have leather upholstery. Likewise, the main controls are pretty good, with all the main interfaces being intuitive to operate and the main touchscreen interface being clear to read and responsive to inputs. Interior storage space is pretty good in the GMC Sierra 2500, with the sizeable door bins being particular highlights. The rear seat backs also fold upwards if you need the rear compartment on ‘Crew Cab’ and ‘Double Cab’ variants as an additional cargo-carrying area – plus, if you go for the range-topping ‘Denali’ trim, the GMC Sierra 2500 also has an array of storage trays and cubbies where the middle seat on the front row would be. Our only disappointment in this area, in fact, is the surprisingly shallow double glove box arrangement. The GMC Sierra is also quite the quiet truck at speed, with wind noise in particular being very well suppressed. Trucks aren’t always renowned for their refinement and comfort, but the GMC Sierra 2500 does a surprisingly good job at being a user-friendly, easy-to-live-with pick-up truck. Whilst it isn’t the most manoeuvrable or comfortable vehicle in this segment, the GMC Sierra is still strong enough across the board to be a pleasant truck to drive. For instance, though the Ram 2500 still has the outright edge in this regard, ride quality is remarkably good in the GMC Sierra 2500, with the vehicle remaining stable, comfortable and composed over bigger bumps and rougher road surfaces. Likewise, whilst there is a bit of tire roar if you go for a more off-road-centric variant, the GMC Sierra is also quite the quiet truck at speed, with wind noise in particular being very well suppressed. The GMC Sierra 2500 can also tow a maximum load of 13,000lbs. As expected from a vehicle of this size, though, the GMC Sierra 2500 isn’t an especially easy truck to drive around tighter sections. The GMC Sierra 2500 doesn’t have the tightest turning circle in the world, so there’s only so far the good forward visibility and light, responsive steering can get you when you’re making sharper turns at junctions. The GMC Sierra 2500 also betrays its size if you’ll ever end up driving the vehicle hard, with body lean when cornering being particularly prominent in comparison with the Ford F-250. However, as most buyers won’t be aggressive when they’re behind the wheel, this shouldn’t pose too much of an issue in the long run. 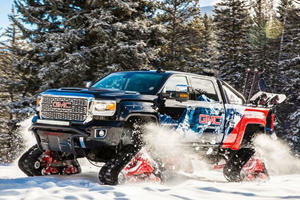 Also worth pointing is the GMC Sierra’s impressive off-road ability (as long as you specify the necessary pieces). The GMC Sierra 2500 can also tow a maximum load of 13,000lbs, which again is pretty good – even though the diesel-powered Ram 2500 usurps the GMC by a sizeable margin with its 17,870lbs maximum capacity. Under the hood of all models as standard equipment is a 6.0-liter eight-cylinder gasoline engine that produces 360-hp and 380 lb-ft of torque. A truck of this size needs a hefty engine, and the GMC Sierra 2500 doesn’t disappoint. Under the hood of all models as standard equipment is a 6.0-liter eight-cylinder gasoline engine that produces 360-hp and 380 lb-ft of torque, which is more than enough for the needs of most GMC Sierra 2500 buyers. It also helps that this eight-cylinder engine is also very smooth and refined, and settles down nicely at cruising speeds on the highway, which helps offset some of the aforementioned refinement niggles. Perhaps the star of the GMC Sierra 2500’s engine range, though, is the diesel offering. Though similar at a glance to the gasoline engine, this 6.6-liter turbocharged eight-cylinder option produces far more impressive outputs of 445-hp and an almost-outrageous 910 lb-ft of torque. In this guise, the GMC Sierra 2500 has no problems with towing especially heavy loads, and is also surprisingly refined bar a slight gruffness to the exhaust note when you apply more pressure on the throttle pedal. If you didn’t have to pay over $8,000 extra for the diesel, we’d recommend it in a heartbeat – alas, unless you really need the extra pulling power the 6.6-liter has, a majority of buyers will be better off with the gasoline setup. You’ll only have one transmission available: a six-speed automatic. Regardless of which engine you end up going for, you’ll only have one transmission available: a six-speed automatic. Though we don’t feel it’s the best automatic you can buy on a pick-up truck nowadays, the six-speed unit in the GMC Sierra 2500 is pretty good by segment standards, and gets the job done via its smooth and fairly quick gear shifts. However, the gear ratios are surprisingly long, so there’s the off-chance the GMC Sierra 2500 can feel a bit bogged down upon changing up a gear when the truck is towing a heavy load. With an entry-level list price of $34,730, the GMC is amongst one of the most expensive offerings you’ll find in this truck segment. Arguably the biggest downside to the GMC Sierra 2500 is its price. With an entry-level list price of $34,730, the GMC is amongst one of the most expensive offerings you’ll find in this truck segment, with equivalent versions of the Ford F-250 ($32,525), Ram 2500 ($31,780) and Chevrolet Silverado HD ($33,310) being noticeably more affordable to buy. You’ll also need to invest even more into the GMC Sierra 2500 if you want a pick-up that isn’t in ‘work truck’ spec. As the base model doesn’t come with that much noteworthy equipment as standard (cruise control and air-conditioning are the big highlights on the out-of-the-box kit list), we’re more inclined to recommend the ‘SLE’ trim that includes Bluetooth connectivity, heated wing mirrors, power windows, a multifunction steering wheel and a reversing camera to the spec list. Granted, this trim does start at $42,035 in its cheapest three-seater ‘Regular Cab’ guise, with prices climbing to $45,075 on the largest six-seater ‘Crew Cab’ model. However, in terms of features, it has a lot of what a majority of buyers will need on a day-to-day basis, so we feel it’s the ideal trim to start at if you’re not looking for a capable yet sparse work truck. The GMC Sierra 2500 has also proven itself to be a fairly sturdy and reliable vehicle. More upmarket version of the GMC Sierra 2500 are available: starting from $47,445 is the pleasantly-equipped ‘SLT’ trim (leather upholstery, power-adjustable pedals, dual-zone climate control), whereas the range-topping, $55,785 ‘Denali’ trim adds all of those features along with built-in navigation, ventilated front seats, wireless charging, a premium audio system and front and rear parking sensors. Considering the price of these specifications, though, we would hesitate on recommending them to a majority of prospective GMC Sierra 2500 buyers. Safety-wise, the GMC Sierra 2500 fares admirably well. Front, side and curtain airbags all come as standard, as does a stability control setup that also includes a trailer sway control function. Overall, these helped the GMC Sierra 2500 on its way to a four-out-of-five-stars safety rating in its most recent crash test. The GMC Sierra 2500 has also proven itself to be a fairly sturdy and reliable vehicle, so there hopefully shouldn’t be any need to make a claim under warranty during your ownership period. If something does go horribly wrong on your GMC Sierra 2500, there are three-years/36,000-miles bumper-to-bumper and five-years/100,000-miles powertrain warranties to fall back on. Buyers who are after a more affordable three-quarter ton pick-up truck might want to give the GMC Sierra 2500 a pass for the time being. Whilst the GMC Sierra isn’t atrociously expensive by segment standards, the combination of a sparse kit list on the most affordable models and the steeper list prices in comparison with cheaper rivals. If it’s within your price range, though, then the GMC Sierra 2500 should definitely be on your radar. 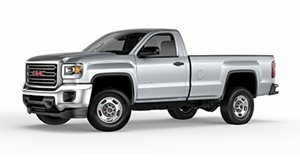 As well as being a comfortable and spacious truck, the GMC Sierra also has some very good engines that endow the pick-up with lots of pulling power, and the interior is amongst one of the best-built you’ll find in this segment. Overall, whilst we admit it’s far from being the most affordable vehicle in this class, the GMC Sierra 2500 is such a strong all-round package that we feel it’s definitely worth considering if your budget stretches far enough.